Another Illusion at the Grammy's??? Re: Another Illusion at the Grammy's??? Oh wow that does look freaky. :o It does look like him with mask and sunglasses. Looks interesting, can you blow it up a bit? Make it a bit clearer? Maybe it is just a reflection from someone in the audience? It kinda looks like a woman. :? All I see is light/reflection in the video and a piece of MJ's hair hanging down. i just saw this Glare on that panel and i thought it was from the sunset in the background but it wasn't!! 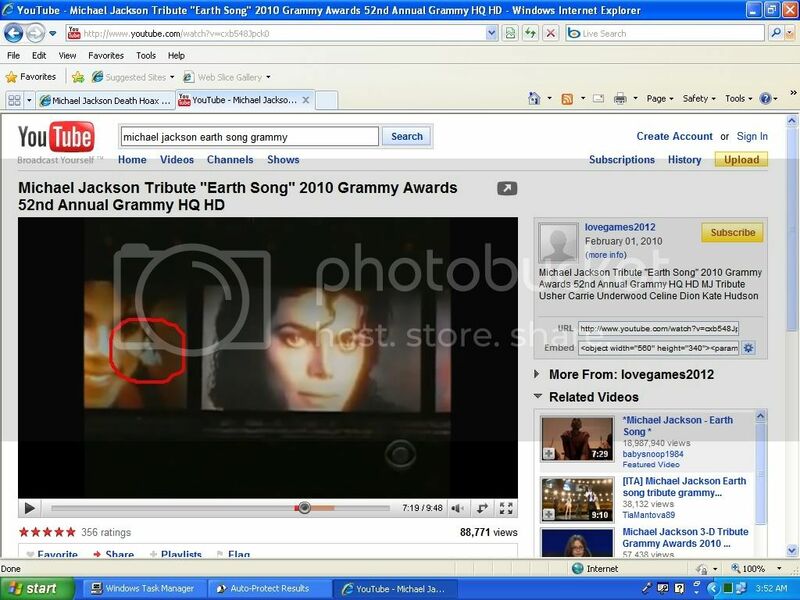 Wow...it does look like Michael....like it is a reflection of him from somewhere else, but reflected on that pic!
" I'm going to shock the world, just watch. " That IS a good catch, but I don't see where MJ could sit in order to be reflected there... I don't think it's possible for anyone in the audience to be reflected on that screen. So I think it's just a small picture of MJ superimposed on the larger one. It's strange, though... Sometimes I think some people are trying to make things look like a hoax -- maybe because it keeps people interested and it's good business? :? In some respects it resembles Paris, but why would there ever be a reflection of her on that screen? I reviewed the actual grammy vid & it is MO that it is MJ. it def is Michael see the surgical mask and long black hair? :D maybe that's him alive! and he wanted to see if anyone would pick up on it? it def is Michael see the surgical mask and long black hair? :D maybe that's him alive! and he wanted to see if anyone would pick up on it? maybe he was sitting in front of the projector!! HAHAH I see it, but I think it's just a combination of his hair and some weird photoshop/lighting thing. I honestly cannot see how this could mean anything large to the grand scheme of the hoax. Interesting though. Michael's Awakening: Reality vs. Illusion Brilliant!! Optical illusion? Look at the judge!! Michael Jackson Master of Illusion new Book! !